Hall of Famers: Umpires: Bill Klem, Tommy Connolly. Athletics: Connie Mack (mgr. ), Frank Baker, Chief Bender, Eddie Collins, Herb Pennock (dnp), Eddie Plank. In the 1913 World Series, the Philadelphia Athletics beat the New York Giants four games to one. The A's pitching gave the edge to a closer-than-it-looked Series in 1913. The great Christy Mathewson lost his Series swan song in the final game to an old college rival and eventual fellow Baseball Hall of Fame member, Eddie Plank. The Giants thus became the first National League team since the Chicago Cubs (1906–1908) to win three consecutive pennants. 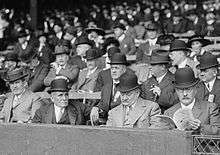 They were also the second club (following the Detroit Tigers 1907–1909) to lose three consecutive World Series; and, as of 2014, the last to do so. The Series itself was an ironic face-off, as the Giants and A's would eventually become crosstown rivals. The A's would win again in a four-game sweep in the 1989 World Series, famous for the earthquake that struck before Game 3, which would be the last World Series victory for the A's. In the opener, J. Franklin "Home Run" Baker drove in three runs with three hits for the A's, including a home run. Frank apparently liked his nickname and wanted to hang on to it. Mathewson and Plank matched craft and guile, and after nine innings it was as it had been at the beginning: 0–0. In the bottom of the ninth, the Giants had put on a stirring baseball version of the "goal-line stand". With none out, the A's had Amos Strunk on third and Jack Barry on second. The next batter, Jack Lapp, grounded to first, where Hooks Wiltse, a pitcher, was filling in. Wiltse made a good stop and threw home to nab Strunk. With Barry on third now and Lapp on first, Plank grounded to Wiltse and Hooks fired home again, getting a sliding Barry. Mathewson retired the next hitter, and the game went into extra innings. In the top of the tenth the Giants broke the ice with three runs, with Matty sprinkling a bit more stardust over his legend by singling in the winning run and then completing the extra-inning shutout by retiring the A's in their half of the tenth. The home team finally won a game, although the visiting Giants made it close in the late innings. So all but one of the five games of the 1913 World Series were won by the visiting team. 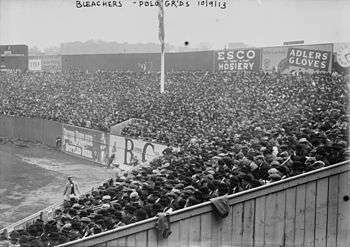 ↑ "1913 World Series Game 1 – Philadelphia Athletics vs. New York Giants". Retrosheet. Retrieved September 13, 2009. 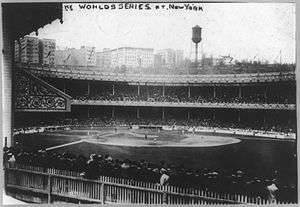 ↑ "1913 World Series Game 2 – New York Giants vs. Philadelphia Athletics". Retrosheet. Retrieved September 13, 2009. 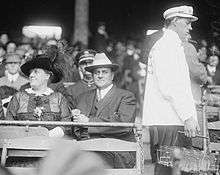 ↑ "1913 World Series Game 3 – Philadelphia Athletics vs. New York Giants". Retrosheet. Retrieved September 13, 2009. 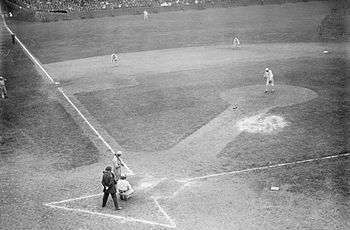 ↑ "1913 World Series Game 4 – New York Giants vs. Philadelphia Athletics". Retrosheet. Retrieved September 13, 2009. 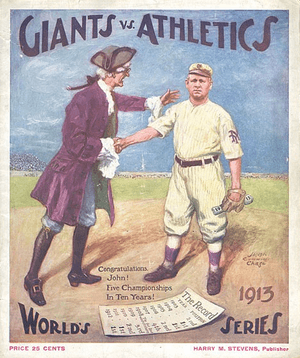 ↑ "1913 World Series Game 5 – Philadelphia Athletics vs. New York Giants". Retrosheet. Retrieved September 13, 2009. Cohen, Richard M.; Neft, David S. (1990). The World Series: Complete Play-By-Play of Every Game, 1903–1989. New York: St. Martin's Press. pp. 48–51. ISBN 0-312-03960-3. Reichler, Joseph (1982). The Baseball Encyclopedia (5th ed.). Macmillan Publishing. p. 2121. ISBN 0-02-579010-2. Wikimedia Commons has media related to 1913 World Series. History of the World Series - 1913 at The SportingNews. Archived from the original on 2008.